A band of muscle fibers, the lower esophageal sphincter, closes off the esophagus from the stomach. 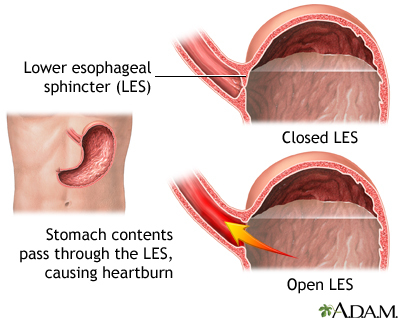 If the sphincter does not close properly, food and liquid can move backward into the esophagus and cause heartburn and other symptoms known as gastroesophageal disease (GERD). To alleviate symptoms, dietary changes and medications are prescribed. For a patient who has persistent symptoms despite medical treatment, an anti-reflux operation may be an option.